...until that coach proves their training actually works for YOUR voice! It is very sad to me when a vocalist comes in to me for the first time with a voice that's been hurt, fatigued or limited in the very act of taking lessons, doing vocal exercises, trying to improve. To put it bluntly, if you come to anyone - including me - for vocal lessons, consulting or directing, you should not trust the coach until you experience success in the lesson. 1. The corrections, directions or vocal exercises suggested cause you vocal strain! Mental strain from doing something different is OK, but you vocal cords should end up unstressed. An intuitive coach will know how far to push each student on any given day, by the sound of the voice. Bottom line: Your voice should feel BETTER - not worse - when you leave the lesson. 2. The teaching doesn't help! A good vocal coach enables you to do something better with your voice. This could be better tone, pitch, execution of vocal licks, clarity of articulation, high notes, low notes, volume, mending of vocal breaks, mixing of registers, richer resonance throughout the range or a noticeable lessening of vocal strain. It could be in your singing and/or speaking voice. You can't expect all this at once lesson, and you may not be able to repeat the improvement techniques habitually yet, but something should really rouse your hopes and make you curious and eager to go farther. Bottom line: Your voice should be able to do MORE, not less, when you leave the lesson. 3. The vocal coach won't listen or agree to teach you what YOU want to sing! This doesn't mean a good coach won't challenge you to go outside your comfort zone... but it should all be for the purpose of enabling you to deliver the type of song that fits YOUR heart as well as YOUR voice. Bottom line: You should leave the lesson confident the coach can and will train you for what you want to sing. ...teaches through intimidation. This may be a mask for what they don't know ... they may try to make you feel like the limiting factor is your lack of talent or intelligence. Or, a sick personality in need of ego gratification may just want you to feel 'less than' in that teacher's presence. That said, if you don't practice, expect to be called on it by a good coach! Teaching is a team sport... you have to do your part for continued improvement. ...wastes time. Be careful judging this... there is a difference between a teacher who doesn't respect the student's time (and money) and a teacher who takes the time to be thorough. Every student is different and care must be taken that vocal instruction is appropriate to that student's needs at that moment in time. A good teacher will also take the time necessary to connect on a personal level with the student (the opposite of intimidation) to create conditions where the automatic nervous system can become unguarded and allow positive changes to take place. ...is not well acquainted with, or is unwilling to teach you, the musical genre you wish to sing. Typically (but not always) a great classical vocal coach is not a great contemporary commercial coach, and vice versa. [Side note: The terms 'vocal coach' and 'voice teacher' are often used interchangeably. However, some define a 'vocal coach' as dealing with vocal style, a 'voice teacher' as dealing with vocal technique. I am both.] Ask! A good coach will readily tell you if they are not familiar or confident enough with a style to teach it. - Did you connect well with the teacher? 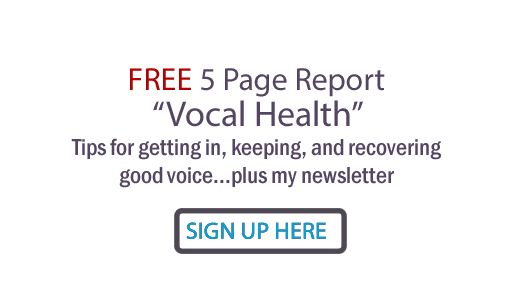 - Does your voice feel more open, free and healthy? - Did you actually experience (even momentarily) some improvement in your vocal ability? Any kind of teacher has to be one that is on your side and should be supportive. My first piano teacher was one of those "bully" type of teachers, and I just hated him. I was eight years old then, and luckily I just taught myself to play. Having encountered two VERY BAD voice teachers, who utterly ruined my voice to the point where I had so much tension I sang with stiff legs, feet, arms and hands and couldn't move them while singing (can you imagine the tension in my neck and mouth region?? ), I concur. Actually, looking back, they didn't teach me a thing - only provided material for me to sing, listened to scales each with without comment, ditto songs, and watched patiently, without any real advice, while I taught this to myself over a period of over a decade!! I then gave up on singing for 8 years, assuming that I simply had some major inability of some kind!! I now have a very GOOD singing teacher who is gradually helping me to undo all that damage, together with vocal unloading practitioners. It's a long road!! Here in Australia there is absolutely NO REQUIREMENT WHATSOEVER for any qualifications for teaching singing, let alone any type of quality system for ensuring that singing teachers are actually ABLE to teach, or accountability for the damage they cause. There should be!! These people can damage a parts of our body, not to mention cause mental issues, when inevitable failure ensues. There should be rigorous training and checking procedures for singing teachers to ensure that those people responsible for the vocal and aural health of their students are actually CAPABLE OF TEACHING!!! You are so right... one has to really do some due-diligence when looking for a good vocal coach. So glad you finally found one! Thank you for your great comment here, it's a good warning to others. If it doesn't work, or it causes the voice to hurt or lose ability, run the other way from that teacher!